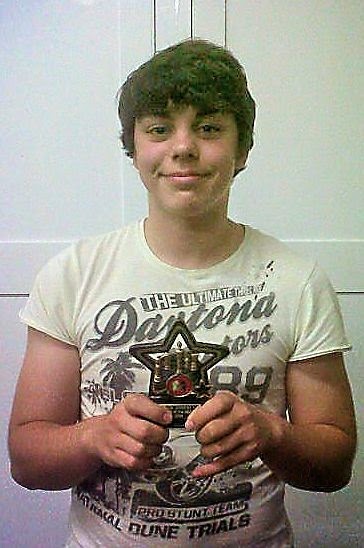 Adam Taylor arrived back in the UK today after an exhausting eleven rounds against some of the world's best Under 16s. His final score was six points, and he gained 25 rating points from the event. Sadly, Adam slipped up in the middle of the tournament, scoring only half a point in rounds six to eight. He finished on a better note, drawing his final round against a higher-rated FM. Seeded 44th, he finished in 38th place. Several matches will be taking place tomorrow, including a number of teams who have already played their first matches. However, two teams who have not yet played at all, will have to wait at least another week. In Division 1, Manningtree A have delayed their start until 15 October, whilst in Division 2, Saxmundham A will play their first match on 7 October. Three other teams, all in Division 3, play their first matches tomorrow. They are Stowmarket Rooks, Saxmundham B and Manningtree B. 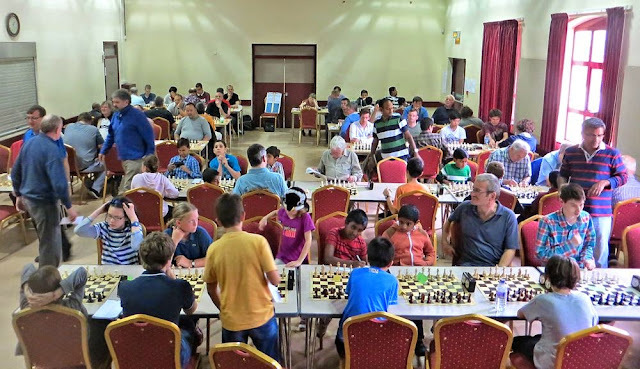 The popular Cambridgeshire Rapidplay which took place today at Whittlesford Village Hall attracted a record 102 entrants. Of these, 17 were from Suffolk (12 from Bury St Edmunds, four from Ipswich and one from Felixstowe). The winner of the Open section was top seed Alan Merry on 4½ points, with David Spence (who drew with Alan) joint runner-up on 4 points. The Major (u160) section was won on 4½ points by players from Banbury and Letchworth. The Challengers (u120) section was won by Gerry Clayton, from Norwich, the only player in the event with a 100% score. The photos are of Roger Smith (Ipswich) and 11-year old Alan John (Bury St Edmunds). Ryder - not the Cup, but the Gambit! With all eyes riveted to the TV set, and Europe leading USA by 10 points to 6, the name 'Ryder' is on everyone's lips. The golfing name refers to the English businessman Samuel Ryder, who donated the trophy in 1927. But we chess-players are more accustomed to the name as the Ryder Gambit, a sideline of the Blackmar-Diemer Gambit. The Ryder Gambit, named after a Dr Ryder of Leipzig who played it regularly in the 1890s, is something of a one-trick pony; if Black accepts the second pawn he can get himself in trouble. The aim is to develop quickly, although the White Queen is depriving the g1 Knight of its most natural square. The d-pawn is en prise, and this is where the gambit can prove lethal should Black accept the pawn. Now White plays 8. Nb5! !, threatening mate in one. Not only that, but the move shields b7 from its defender. It was Emil Josef Diemer who first played this move in 1934. How can Black respond? The only move that prevents an early loss is 8... Na6, although correct play by White should give an advantage. Everything else loses quickly. For example 8... e6 (or ...e5) fails to 9. Nxc7+ Ke7 10. Qxb7! Qxb7 11. Bc5#. Or 8... Nbd7 9. Qxb7 Rb8? 10. Qxb8! Nxb8 11. Nxc7#. Going back to the position after 6. Be3, Black is best advised to play ... Qg4, when White usually responds with 7. Qf2. The game remains double-edged, with Black's Queen exposed to various attacks. Try it sometime (probably not in a league match!) and see how it goes. 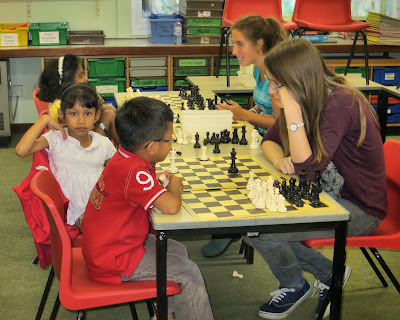 This evening's Club Night at the Bury Knights Junior Chess Club saw a record attendance of 45, which included 16 girls. This was the highest number attending for over ten years and demonstrates the current enthusiasm for chess in Bury St Edmunds. Suffolk Ladies' Champion Emilia Jewell helped with the coaching of novices (see photo left), whilst the remaining 37 members played in four divisions. The members range in age from 5 to 14. There are 18 girls (more than one-third) amongst the total membership of 53. Today being 25th September, there's exactly one month to go before the 32nd Bury St Edmunds Congress, which starts on 25th October. As of today's date, we already have 55 entrants, with the Minor section the most popular with 21. 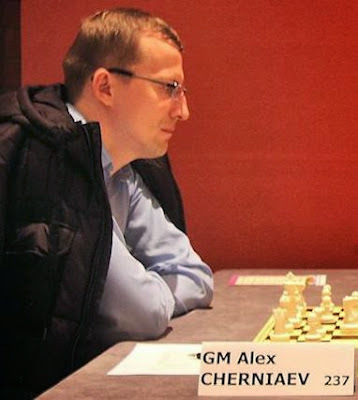 The top seed, and the only Grandmaster to enter so far, is Alex Cherniaev, who hails from Archangelsk in Russia. He still has to obtain his visa, but that hasn't been a problem in previous years. If any local person is interested in having a GM to stay, Alex is looking for accommodation for the Saturday night! As well as Alex, we have two IMs and a Women's International Master. In fact there are already six players graded over 200 in the Open. You can check the list of current entrants (updated daily) here. 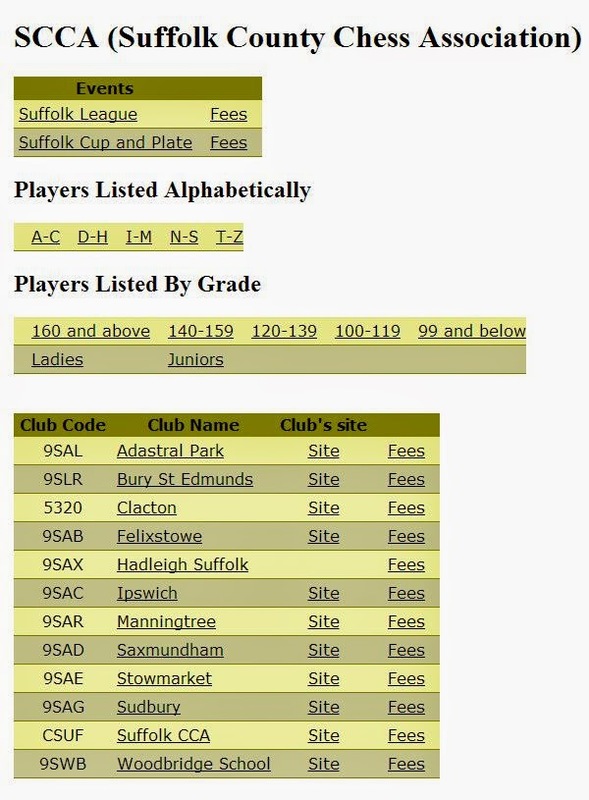 In recent years Suffolk have only been able to field an Open team and an Under 160 team. Last season, an Under 100 team was added. This year we will field four teams, with an Under 120 team being added. 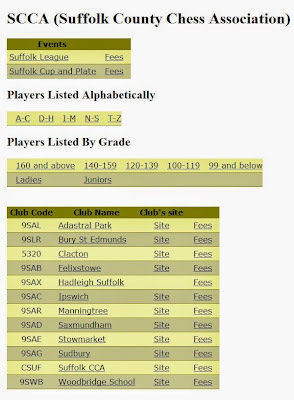 We have been fortunate to find two able captains: the Under 100s will be captained by Daniel Yarnton (97) of Stowmarket, whilst the Under 120s will be captained by Peter Collicott (107) from Saxmundham. Many thanks to both for agreeing to captain these teams. Both Norfolk and Cambridgeshire will have teams in the u100s and u120s. The date for these teams' matches has not been decided yet, but it is likely that the Under 120s will play alongside the Open teams, whilst the Under 100s will play at the same time as the Under 160s. Round 4 yesterday saw Adam paired against an FM rated 2397. Overnight Adam had been ill, so it was fortunate that the match was not scheduled to start until 16.00 local time. The result, a draw, was excellent in the circumstances. Adam's current Elo rating is 2023, which seems much too low for someone who has a 204 ECF grade (recently revised from 203). This event is certainly an opportunity for him to gain some useful rating points. Today was a double-round day and in the morning he faced another 2300+ player, from Belgium. Again he managed a draw to arrive on three points from his five games. In the afternoon he was paired against a 2246-rated opponent from Croatia, but sadly lost. So, after six rounds, Adam remains on three points. He has gained 51 rating points over these six games. Tomorrow is a rest day, but on Thursday he will face a lower-rated player from Australia. The remaining five rounds are all on separate days, so no more exhausting double-round days! The current leader is the 2496-rated top seed, who is on 5½ points. The 'other' local league, the Bury Area Chess League, which includes three Suffolk teams (Bury St Edmunds, Newmarket and Stowmarket) starts today. The first match is between two Cambridgeshire clubs - Ely Beet and Cambridge Examiners, in Division 1. The other Cambridgeshire team in the League, Linton, play their first matches on Thursday, when two of their teams travel to Bury St Edmunds. One of the Bury St Edmunds' teams, the 'Scorpions', consists entirely of Ipswich-based players (Graham Moore, Steve Gregory, Tim Lunn and Ian Wallis). They all enjoy playing the different (and strong) opponents that they face in the BACL. These include IM Richard Tozer (207), David Coleman (207), Martyn Goodger (205), as well as a host of 190+ players. The Cambridgeshire Rapidplay, organised by Paul Kemp, takes place at Whittlesford Village Hall on Sunday 28 September. This event is always well-supported and well-organised, and entrants can play in one of three sections: Open, u160 and u120. For further details, contact Paul. 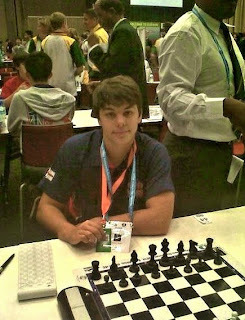 After two rounds in the World Youth Championships in Durban (see yesterday's article), Adam Taylor was one of only two English players with a 100% score. In the first round Adam (2023) beat an unrated player from Burundi and in Round 2 beat a 2256-rated player from France. With 17 players on 2/2 and Adam the lowest-rated player, it was surprising that he received the downward float to play the highest-rated player on 1½ points; this was the third seed, from India, an IM rated 2462. That seems a strange pairing to me; I would've floated down the median from the black-seekers. Anyway, in a Ruy Lopez Berlin Defence, Adam always seemed to be on the back foot. Because he was on one of the top boards, you can view the whole game here. In the position below, Adam played 38...Kg6 and resigned after 39. Bc5 Re6 40. Bxe7 Rxe7 41. Rxd5. Stockfish gives 38... Ke6 as the best move for Black, followed by 39. Rh5 Rd8, when Black may well be able to hold out for a draw. Still, a very creditable performance by Adam. At the time of writing, the pairings for Monday's Round 4 have not been made. But Adam can certainly expect another tough opponent. At least he should have the white pieces this time! Edit: And tough it is! A 2397-rated FM from Ukraine. 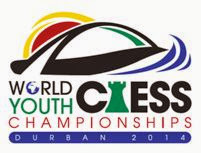 Down in Durban, South Africa, the World Youth Chess Championships begin today. Ten English players, including Manningtree's Adam Taylor, will be competing against the World's best juniors. The Opening Ceremony is today, with the first round starting immediately afterwards at 16.00 local time (15.00 British Summer Time). 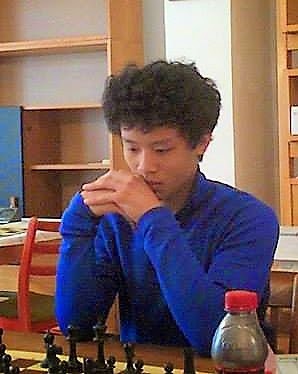 The Congress website is here, with Adam's section here on Chess-Results.com. You can also watch the top games in the Under 16s on Chessbomb. We'll update you on Adam's results as the event progresses. Answer to yesterday's position (Peck v Collins): Qc5+!! 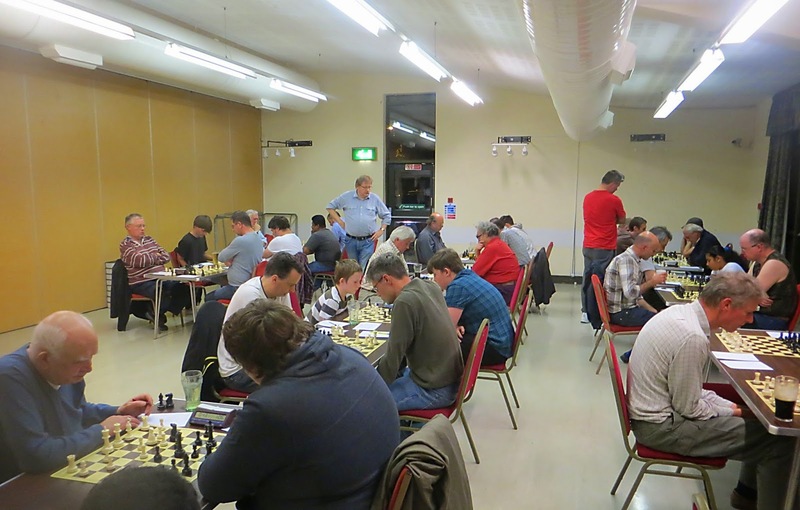 There was a full house at the Bury St Edmunds club last evening, with four teams from Ipswich Chess Club playing against teams from the host club. Two individual results stand out: Stephen Pride (Bury B) 147 beat Nick Savage 184; and Fraser Fallows (Bury E) 61 drew with Mike Spalding 116. This position occurred on Board 3 in the Division 1 match between the two 'C' teams. Silas Peck (White) to play. See if you can find the single move that forced Jon Collins (Black) to resign on the spot. We'll give the answer tomorrow. 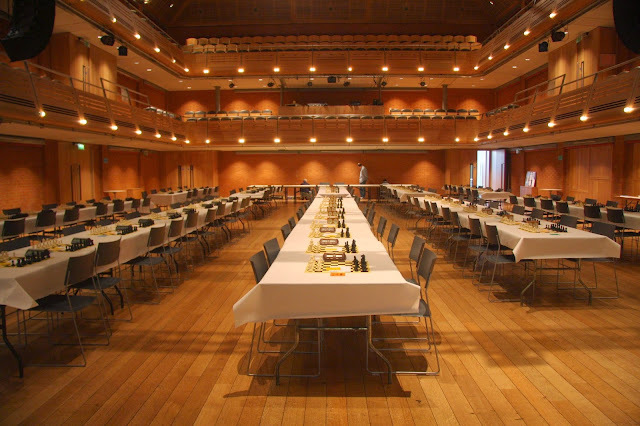 There are just over five weeks to go before the Bury St Edmunds Congress takes place at the Apex! 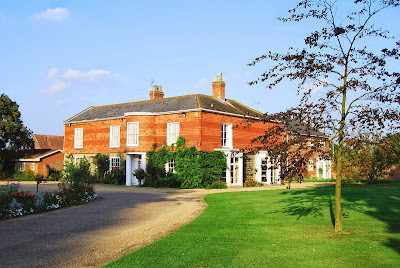 The photo below shows the amazing playing area, surely one of the best venues for a weekend chess congress in the whole of the UK. The Apex is situated in the centre of the town, with shops and restaurants just a few metres away. Enries are coming in faster than at any time in the previous 15 years that Bob Jones has organised this event. They currently stand at 46. In 2010, when a record 173 players competed, the number of entrants at this stage (37 days to go) was only 28. You can enter (and pay) on line here, or simply register and post a cheque. Last evening saw the first match in the Suffolk League, between Ipswich E and Felixstowe in Division 3. The result? An excellent 2½ - 1½ win for Felixstowe, with wins for Phil Hopkins and Dave Robertson, and a draw for John Barty. You can follow Felixstowe Chess Club's progress on their Facebook page. Several matches will take place on Thursday, when four Ipswich teams travel to Bury St Edmunds (three in Division 1 and one in Division 3). All clubs have submitted their nominated boards, which can be viewed here. Board 1 in Division 2 is higher than Board 4 in Division 1. Similarly, Board 1 in Division 3 is higher than Board 4 in Division 2. 19 people played in the Open section, which was won by local player Kamil Przybyla (213) on four points. Three Suffolk players came joint second on 3½ points: Dagne Ciuksyte, Steve Gregory and Ian Wallis. Ian's grading performance of 190 exceeded his published grade by 13 points. Dagne faced Kamil in the final round, but had to be satisfied with a draw. Other Suffolk scores in the Open were Silas Peck (Ipswich) and Chris Davison (Bury St Edmunds), both on 2½ points. 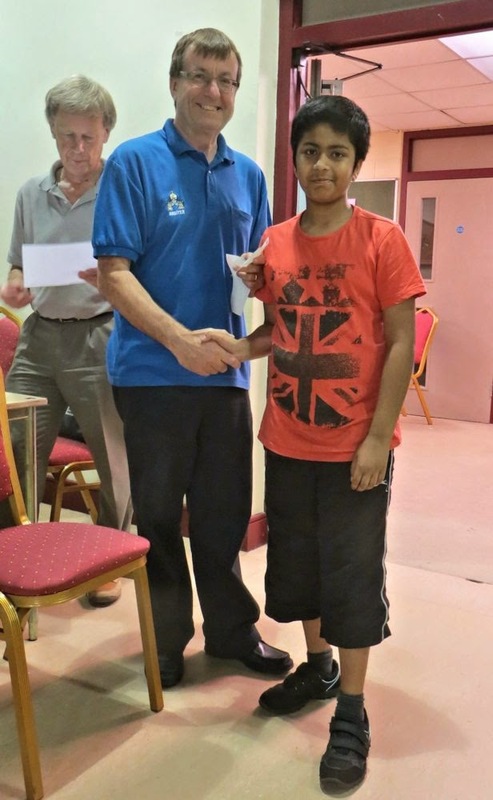 In the Under 150 section (20 entrants) the top Suffolk player was 10-year old Anita Somton (128) on 3 points, with a grading performance of 140. Mark Pulman (Saxmundham) scored 2½, whilst Alex Sheerin (Ipswich) was only able to manage two draws from his five games. 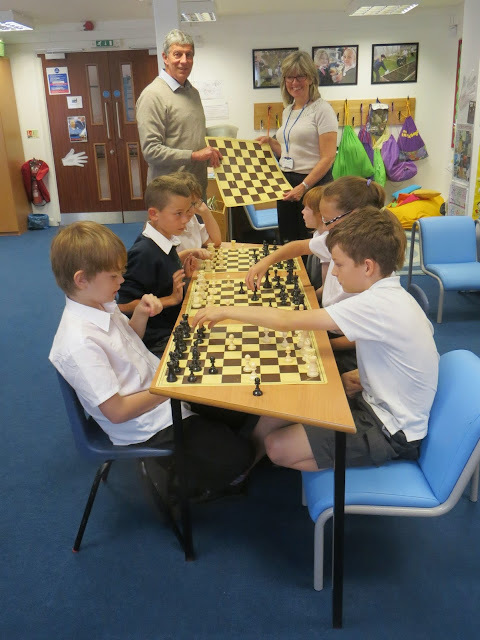 Today it was the turn of Chilton Primary School in Stowmarket to receive six sets and boards, courtesy of the Bury Knights Junior Chess Club. The photo above shows Bob Jones making the presentation to Liz Bennett, Head of Chilton Primary. Six eager children tried their hand at the game, most for the first time. It is planned to start up the school chess club after half-term. Here are four questions for you to solve. Don't use a chessboard! Try to work out the answers in your head. Q1. How many legal moves does White have if all 16 pawns are removed from the chessboard before the start of play? Q2. What is the minimal number of queens that can be placed on the chessboard such that every square is attacked by at least one of them? Q3. What is the maximum number of knights which can be placed on the chessboard so that none of them attacks another? Answers on Tuesday. You can email me with the answers if you like. 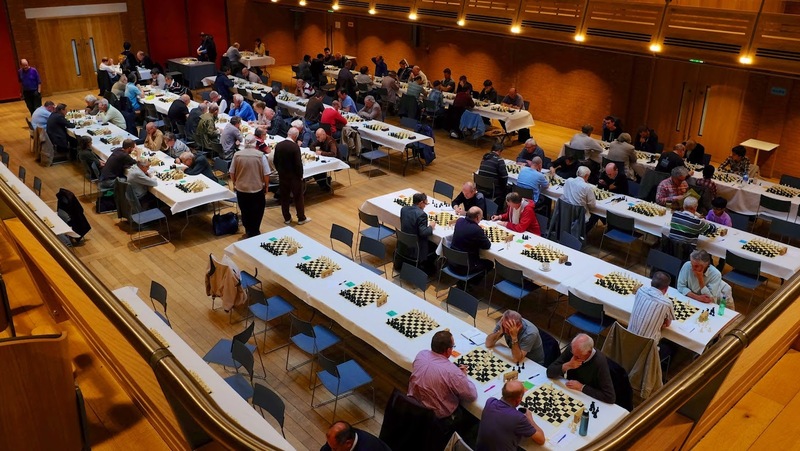 The annual Bury Area Chess League Jamboree took place on Thursday evening at Moreton Hall Community Centre, the home of the Bury St Edmunds Chess Club. This event is a great way to start the season, with all the clubs coming together for three friendly Rapidplay games. Everyone gets to play members of other clubs, not their own. A total of 14 teams entered, including six from Bury St Edmunds, three from Stowmarket and two each from Cambridge City and Linton. The other club to enter was Newmarket. Bury St Edmunds teams filled the next five places. The winning team consisted of three strong juniors - Akito Oyama, David Redman and Austin See, as well as Club Chairman John Daugman. Those on 2½ points included Mike Harris (Bury St Edmunds), Akito Oyama (Cambridge), John Peters (Bury St Edmunds), Martin Pinner (Linton), David Redman (Cambridge), Patrick Ribbands (Linton) and Somton Ukken (Bury St Edmunds). 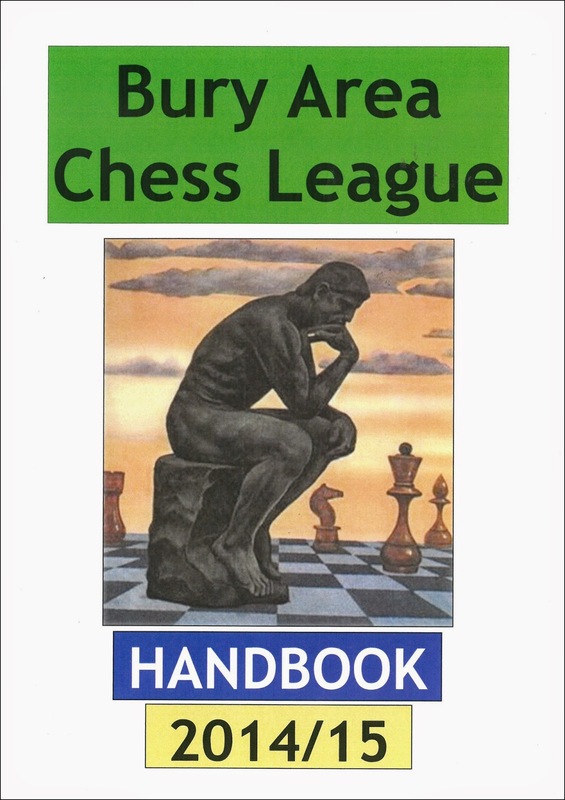 The Bury Area Chess League season commences on Monday 22 September, when Ely host Cambridge Examiners. Suffolk Ladies' Champion Emilia Jewell gained 14 A*s in this year's GCSE results. Congratulations! Pictured left at a recent Training Day for Bury Knights Juniors, she was one of the top pupils at St Benedict's Upper School (one other achieved 14 A*s and an A). This season Emlia (130 ECF) will be playing for Bury St Edmunds 'D' team in the Suffolk League Division 2. Every season the Bury Area Chess League, which includes teams from Bury St Edmunds, Stowmarket, Newmarket, Linton, Ely and Cambridge, produces a Handbook which lists all the fixtures, as well as the League rules, club contact details, and grades of eligible players. This 36-page colour booklet can be purchased by non-Bury League players at a cost of £2.50 including postage. Contact Bob Jones. Following the donation of six chess sets and boards to Woolpit Primary School back in March (see here), another school has taken up the offer. 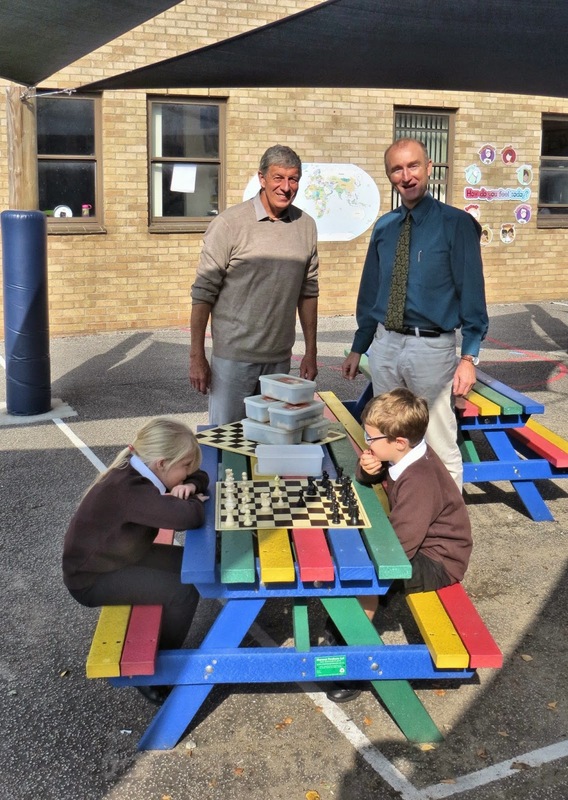 Bob Jones visited Abbot's Hall Primary School in Stowmarket, where teacher Chris McGrath, pictured right, took possession of another six sets. Chris has plans to start up a school chess club that will meet every week. These chess sets have been provided by the Bury Knights Junior Chess Club, who purchased 20 new sets last year and have recently taken back ownership of a further 12 sets that had been on semi-permanent loan to the Bury St Edmunds Chess Club. Any other school in West Suffolk that is keen to establish a chess club should contact Bob. Just occasionally, when there's no 'hot' news, there will be a puzzle for you to solve. The answer will be provided tomorrow. In the position below, Black is a pawn down (knight and pawn against a rook). It's Black to play. How can Black turn the one-point deficit into a one-point advantage? Woodbridge School's Justin Tan (grade 239 ECF) will be giving a simultaneous exhibition on Saturday 20 September. Anyone is welcome to attend and play against Justin. If you are interested, please email Adam Hunt. This event, which commences at 10.00, is part of an Open Day at the school. 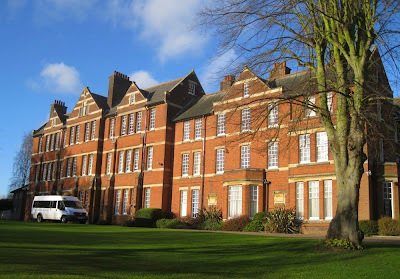 Woodbridge School, which also has a Preparatory department based at The Abbey, has two active after-school chess clubs. On Wednesdays the senior school chess club takes place, whilst the Abbey chess club is held on Thursdays. Both clubs are open to children who live locally but do not attend the School. Suffolk County Chess Association President Colin Roberts is keen to fill the remaining vacancies on his Committee. I (Bob Jones) have been nominated and seconded as Vice-President and will be standing for President at the next AGM in June, when Colin's three-year term of office expires. So I, too, am keen to see these positions filled, especially the first. We haven't had a Junior Organiser for several years, after Adam Hunt stood down from the role. 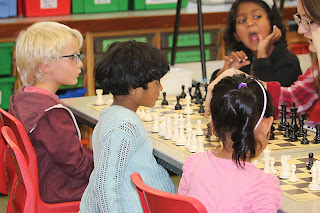 It's particularly important, because every club in Suffolk needs a few up and coming juniors; they are after all the future of Suffolk chess. 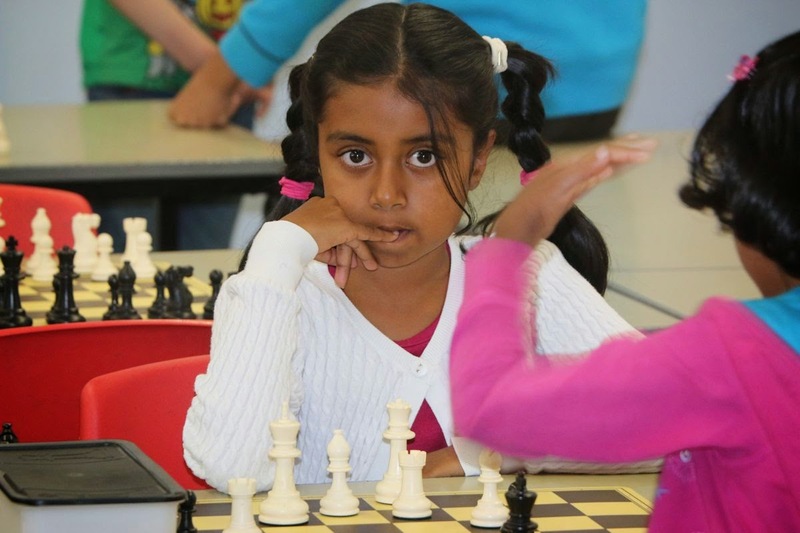 The Junior Organiser should be able to encourage more schools to run their own chess clubs. Also, there's a glaring gap in Ipswich, where the population of over 130,000 people has no junior chess club. Two children travel all the way to Bury each week because there's no alternative. Anyone considering any of these positions should contact me, in the first instance. I can provide more information as to the level of commitment that is required. Although there are still seven weeks to go before the Bury St Edmunds Chess Congress on 25 / 26 October, entries are flooding in. To date there are 37 paid-up entrants. This is way ahead of previous years. The Apex, pictured above, is considered to be one of the best chess venues in the country. There's a limit of 172 entries, due to space restrictions, so make sure you get your entry in soon! You can enter online here. After a four-month break, the Bury Knights Junior Chess Club sprung back into action last evening, with more than 40 children attending. 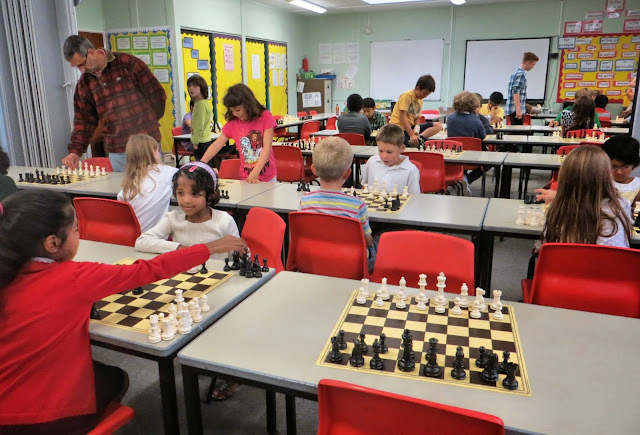 The Bury Knights is currently the only junior chess club in Suffolk. It's a great pity that Ipswich, with a population some three times that of Bury St Edmunds, is unable to sustain a junior club. In addition to 34 existing members, seven children turned up for their first chess club. They were put into a special 'Novices' group, where three coaches - Suffolk Ladies Champion Emilia Jewell, 15-year of Alba Saenz, and Sam Starling (mother of William), helped to teach the children the basics of the game (see photo below). 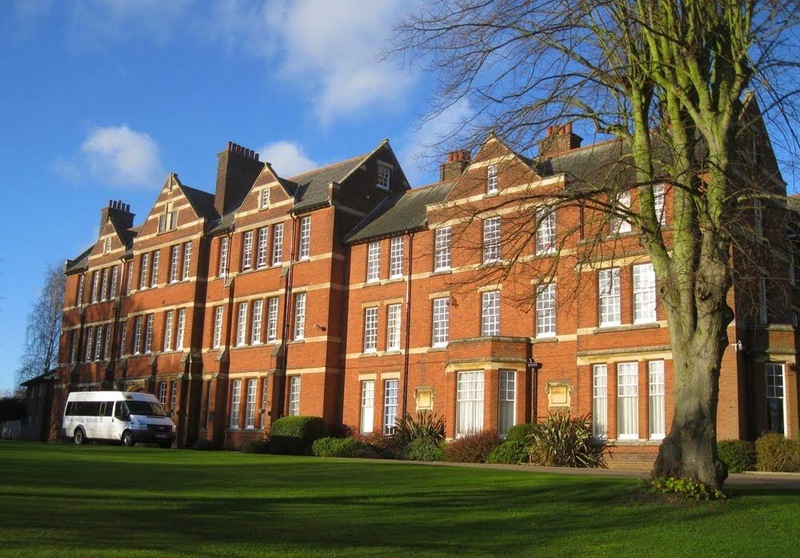 Due to space limitations at Horringer Court Middle School, as well as supervisory concerns, the number of members will need to be limited to 50. It is envisaged that this number may well be reached in the next few weeks, as several other new members are expected. 16-year old Adam Taylor, top board for the current League Champions Manningtree A, has been selected to play for England in the forthcoming World Youth Chess Championships in Durban, South Africa. The 11-round event starts on 19 September. Sadly, representing England at chess is not the same as in most other sports: the cost of travel and accommodation has to be borne by the parents. Adam's mother Debbie will in fact be 'Head of Delegation', responsible for the ten youngsters in the England team. The cost to the family will be in the region of £3,000. 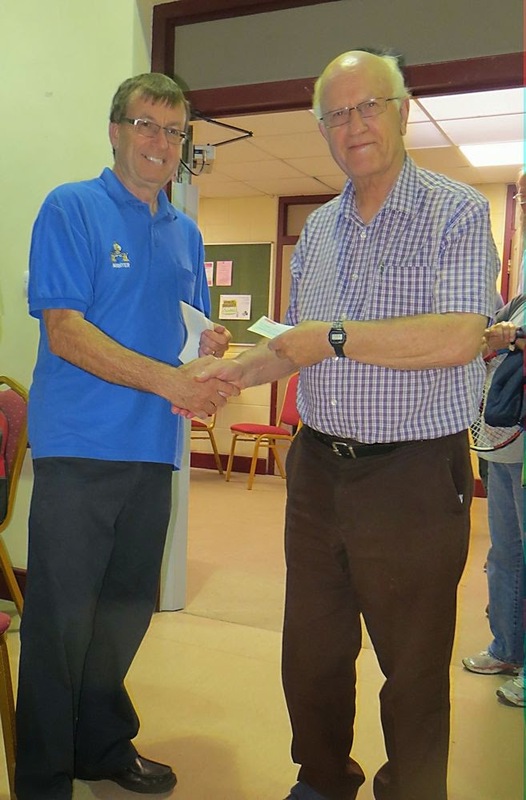 The Suffolk County Chess Association, at its AGM in June, awarded a grant of £100 to Adam and several individuals also contributed. If anyone else would like to make a donation, however small, it will help to offset the enormous expense that Debbie has to bear. Click here to see the full England team and their profiles. Competitions Secretary David Green has completed the fixtures schedule for the League and the new Cup & Plate competition. The Under 125 Cup fixtures will follow in a couple of weeks' time. It is likely that this event will not commence until December. This hasn't been an easy task for our new Comps Sec. Some clubs have restrictions on the number of matches that can be played, and then there's the need to dovetail with the Bury Area Chess League (where Bury St Edmunds and Stowmarket play) and the North Essex League (where Clacton also play). Club Secretaries have also asked for some fixture dates to be changed, for various reasons. Hopefully the version that has now been published will be the final one (although one amended date is still awaiting confirmation). Dave Wild's excellent website shows all the fixtures here. Last Saturday, outside the Apex in Bury St Edmunds, 10-year old Anita Somton took on all-comers, playing as many as ten opponents at a time. In total, she played about 20 games, drawing two, losing one (a back-row mate! ), and winning all the rest! Anita's current ECF grade is 128 and she has a target of 150 for the next list, to be published in January. In October, Anita will be travelling with her father to Batumi, in Georgia, for the European Youth Championships. She will represent England in the Under 10 Girls section, where she will face the top players from the likes of Russia, Azerbaijan, Hungary, Romania and many other European countries. This trip alone will cost £2,000, and she can expected to be selected to play for her country on many future occasions. 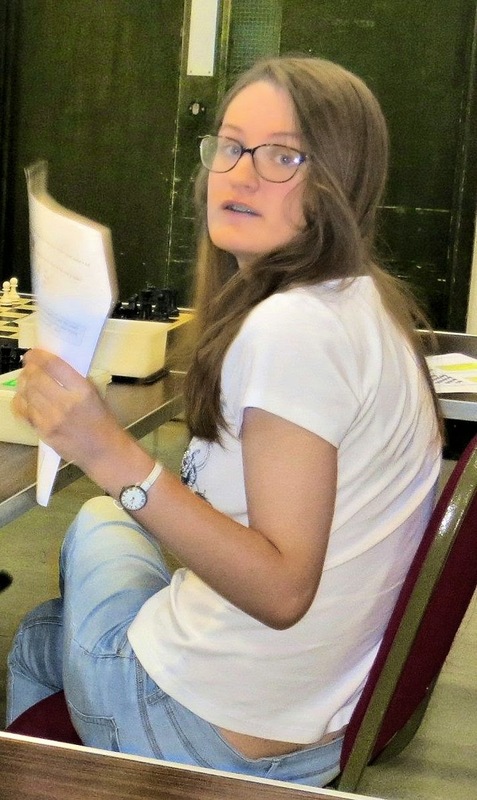 It is hoped that some local companies can be encouraged to support Anita financially in her burgeoning chess career. It's the 1st of September and time for the Suffolk Chess website to awake from its summer slumber. From now on, there will be an article every day (except when I'm on holiday). As usual, articles, photos, news from the Clubs will be welcome. Last Tuesday, the Suffolk County Chess Association held two Extraordinary General Meetings. It's somewhat unusual to need to hold one EGM, let alone two. But the Constitution states that an EGM may only consider a single issue. We needed to consider two, hence the consecutive meetings which took place at Ipswich Chess club with me (Bob Jones) in the chair, as President Colin Roberts was unavailable. 17 people attended the meeting, surpassing the required 12 for a quorum. The first EGM voted to restore the Under 125 Cup competition. This event had been dropped from the programme at the Annual General Meeting in June, but subsequently considerable opposition was expressed. The Committee therefore decided to raise the issue at an EGM. Four clubs (at least) have agreed to provide teams for the u125 Cup and Competitions Secretary David Green will soon be publishing dates for the first round. The second EGM was held to approve the revised competition rules. Over the past couple of months the Rules Sub-Committee has been hard at work re-writing the rulebook. This was no simple task and it proved difficult for members of the sub-committee to agree on a 'final' version. Eventually, and just in time for the EGM, a version that was generally acceptable to the sub-committee was distributed to the affiliated clubs. At the EGM, following an hour's discussion on some of the more contentious rules, a vote was taken. Although there were three abstentions, everyone else present voted in favour. The new rules can be seen here, or by clicking on the 'Rules' tab at the top of the page.